FeastHome – A color influences your mood. If you find your backsplash too dull, that means it asks for a pop of refreshing color. 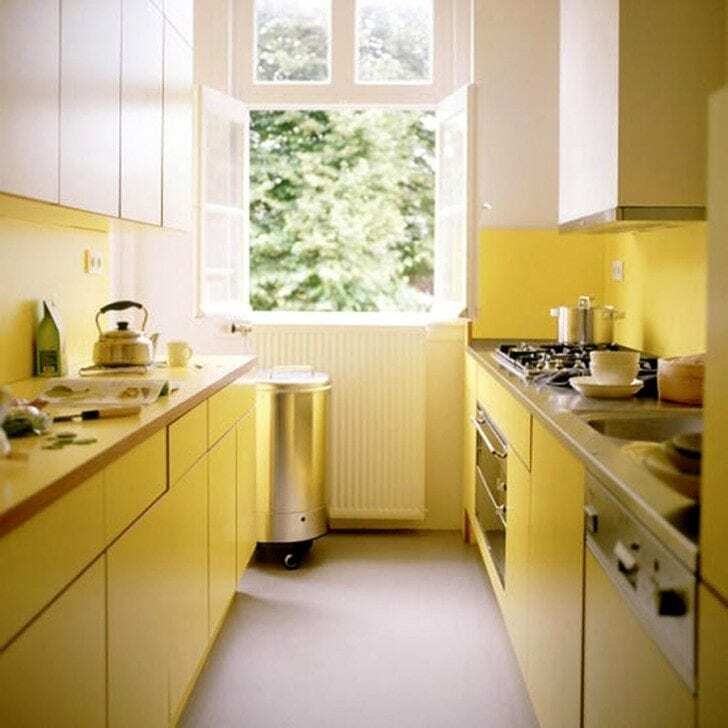 And yellow kitchen backsplash would be a perfect go-to option when it comes to the kitchen. 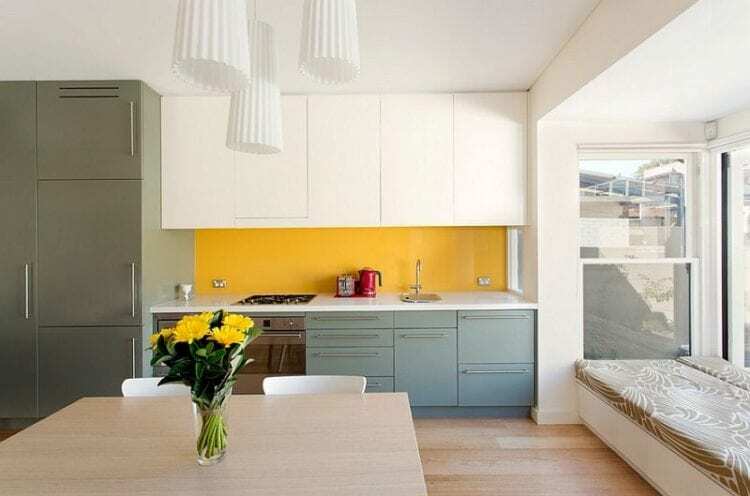 Yellow colored backsplash turns your drab kitchen into a bright area. Plus, this shade has a huge range of pretty hues, from buttery yellow to ochre. Can’t wait to spruce your kitchen up? Check these inspiring ideas out! Here, white cabinets embrace a modern flair due to their sharp edges and straight lines. 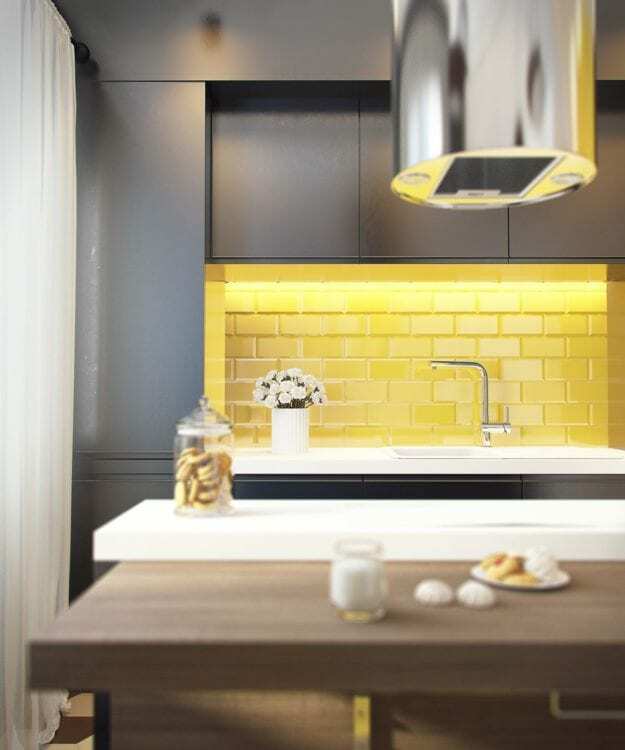 Saffron yellow on subway backsplash tiles invigorates the whole zone. Wooden countertop and kitchen island elicit the inimitable warmth. A monochrome wall decor completes the look. You do not need to spend an exorbitant amount of money for a terrific kitchenette. 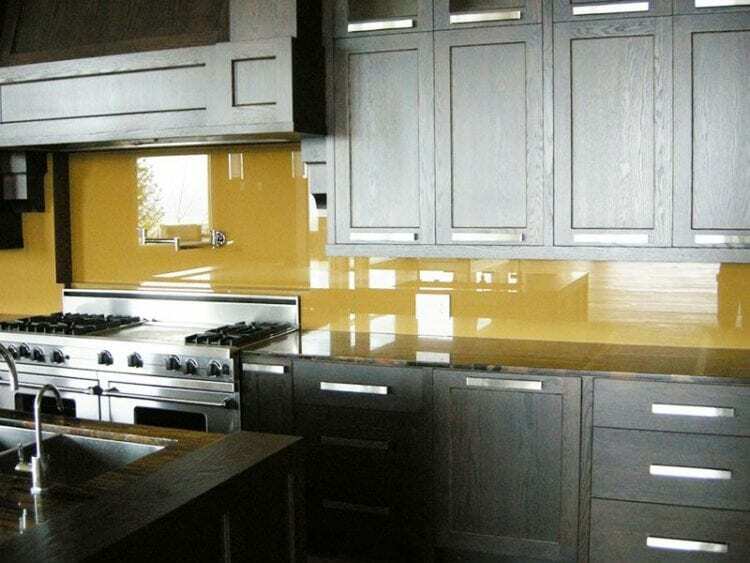 All you must do is installing the mustard yellow painted acrylic backsplash. It is affordable and captivating. Moreover, the white wall and cabinetry develop open setting. While the taupe countertop fills the area with a soothing atmosphere. As the picture shows, this streamlined cooking space employs minimalist cabinets, white ceiling, and floor. However, the area does not seem pale and lifeless. Thanks to the luminous splashes of yellow. The backsplash itself is clad in the painted glass panel. To create a seamless appearance, it is paired with a countertop in the same shade. Beautiful! 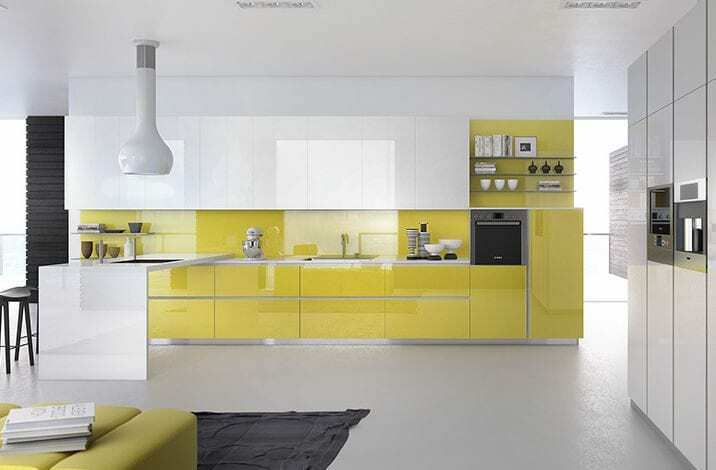 The urban dweller excellently outfits the kitchen with bumblebee yellow floating lower cabinetry and glass sheet backsplash. They pop against the white countertop and upper cabinets. A futuristic ceiling light illuminates the area after dark. Three open shelves display black and white ornaments. There is a breakfast nook too. Don’t you love it? This is the kitchen that we fall in love with, over and over again. Look at the grey built-in cabinets, stainless-steel faucet, and light fixture. They produce an industrial appeal with ease. Unfinished wooden dining table injects rustic charm into the zone. Blooming white flowers energize the area. And glazed yellow metro tiled-backsplash depicts a buoyant life. This Nordic-inspired kitchenette features white wooden cabinets. Along with wooden floor, dining table and chairs, they deliver heaps of texture to the area. 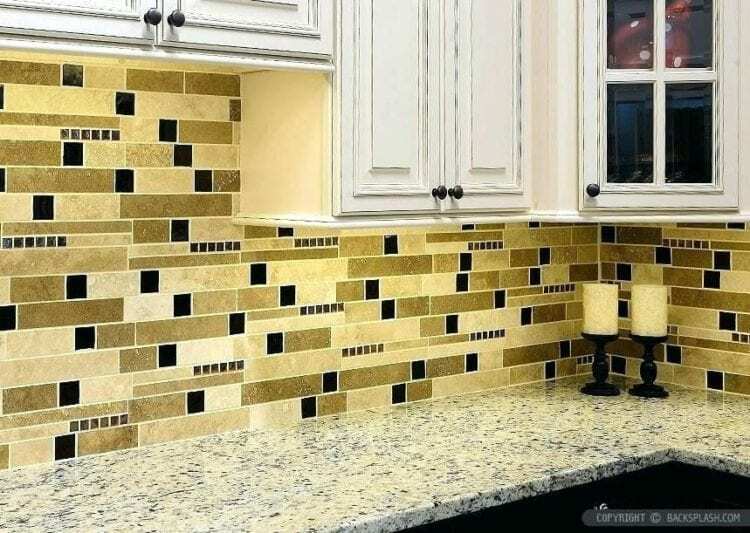 The yellow subway backsplash tiles are installed vertically. Container, pendant light, and fruit bowl give the space a playful aura. And leafy plant makes the kitchen lively. Stainless-steel faucet, cooker, and range hood offer an industrial aesthetic. 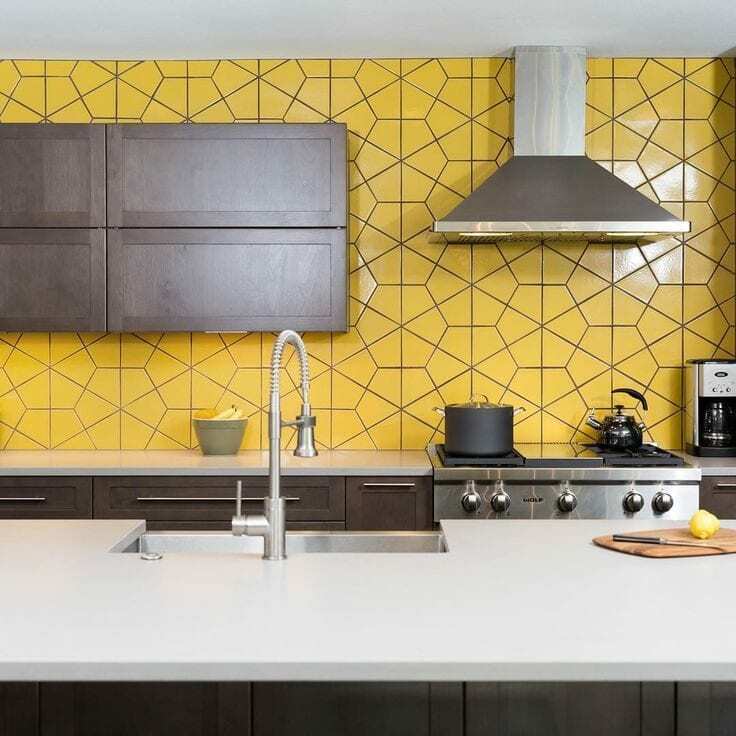 The yellow hexagon patterned tiles on backsplash generate a visual interest and warmth at once. Grey metallic wooden cabinets are mounted on the wall. They offset the vibrant backsplash while matching with white countertop and dark wooden lower cabinets. The homeowner adds depth to the kitchen by extending backsplash to the ceiling. It is made up of yellow metro tiles. The backsplash also does a fantastic job in taking the blandness off white ceiling, walls, and cabinets. Concrete countertop and stainless-steel units provide a rustic character. Lastly, a quirky pendant light with a metallic accent radiates soft glow. This ultra-chic cooking space draws attention. 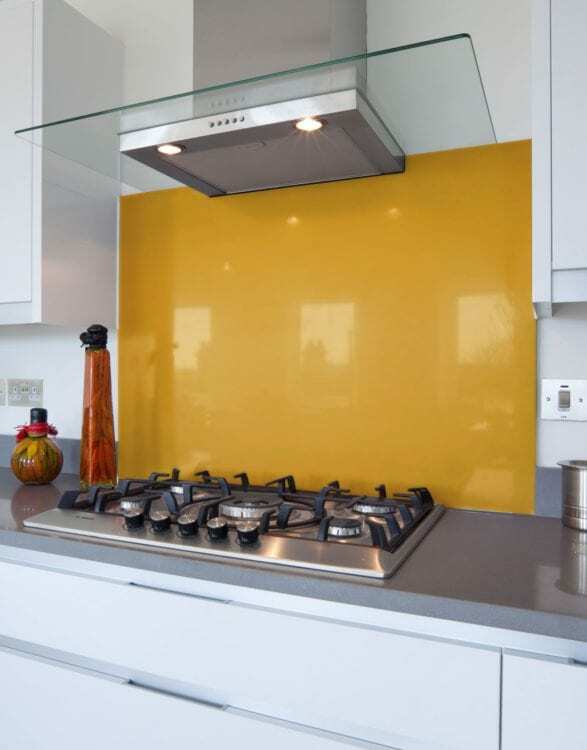 The amber yellow acrylic backsplash perks the kitchen up. It meets the white countertop and minimalist cabinet in a tasteful contrast. Paper cup pendant lights definitely channel your inner baker. Light wood floor and dining table ooze the cozy ambiance. The kitchen is teeming with stunning colors such as steel blue, khaki green and red, too. As seen in the picture, the kitchenette is not spacious, but glorious. Thanks to the lemon yellow beadboard backsplash and walls. They instantly convey cheerfulness. Glass windows bring morning sunlight into space. As a result, the kitchen looks sunny and airy. The decorative pieces hung on the wall complement the area. And an orange tulip in the glass vase infuses natural touch into culinary space. Here, we have a rustic kitchen with a traditional twist. The white cabinets set the classic charm. They also keep the cooking space bright and open. Furthermore, underfoot are polished limestone floor tiles. 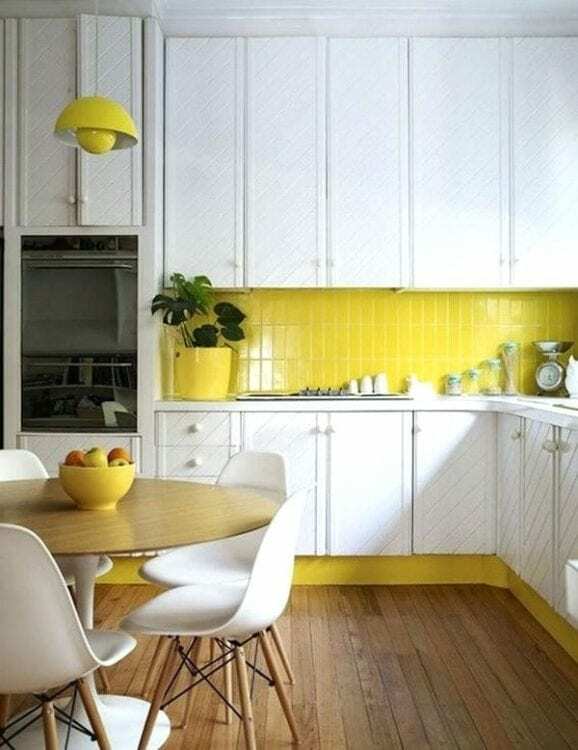 Skinny cream yellow subway backsplash tiles soothe the space. Under cabinet, a light illuminates the wooden countertop. Black and yellow is such a winning combo. This culinary space is real proof. Both lower and upper wooden cabinets come in black. They exude the natural drama and dimension. 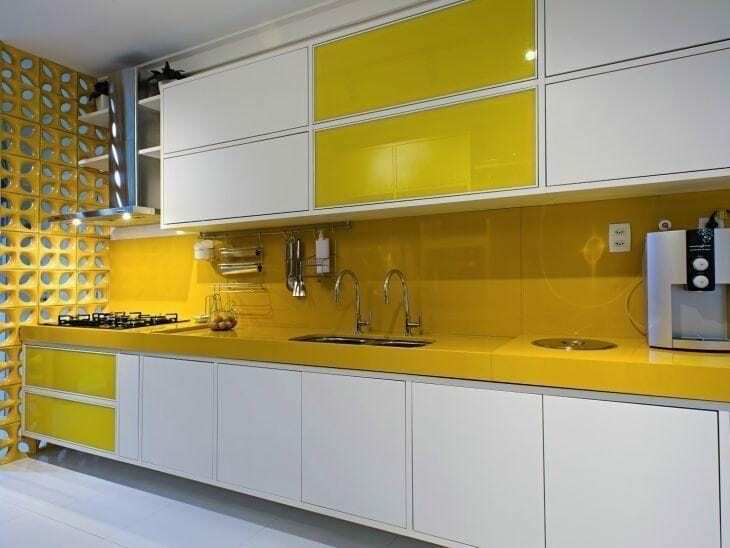 The yellow glass backsplash allows the kitchen to feel fashionable. While the stainless-steel appliances and hardware gives an understated glamour. 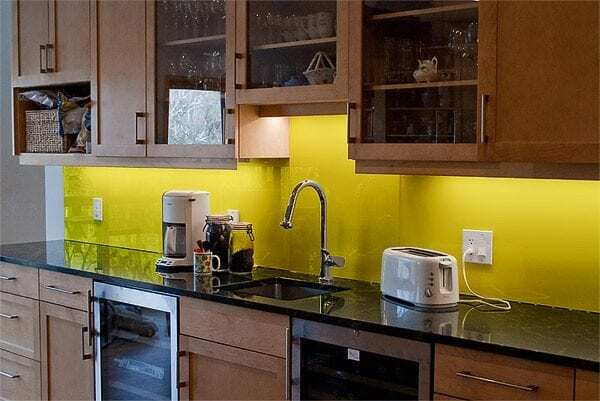 The glass sheet backsplash in this kitchenette serves up a healthy dose of pineapple yellow. It stands out against the black countertop and white cabinetry. Dark wooden floor and kitchen island complement the plain white walls. The metallic dining chairs lend an industrial appeal. The kitchen boasts medium-toned wooden cabinets. They warm up the whole culinary space. Plus, they provide a rustic charm quickly and keep the cooking utensils out of sight. 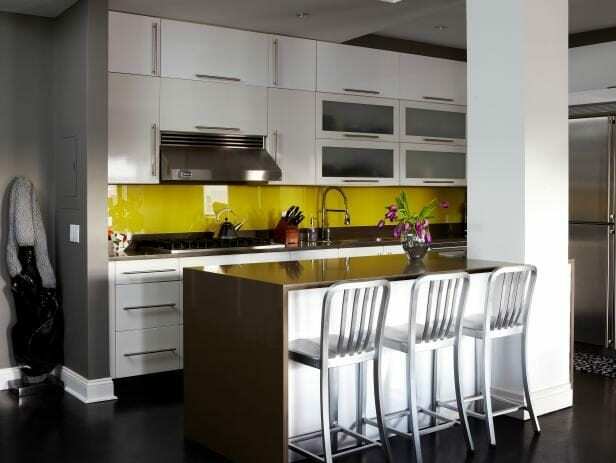 Additionally, the appealing yellow-painted acrylic backsplash rivals black concrete countertop. Well, you obviously like cooking in this room. 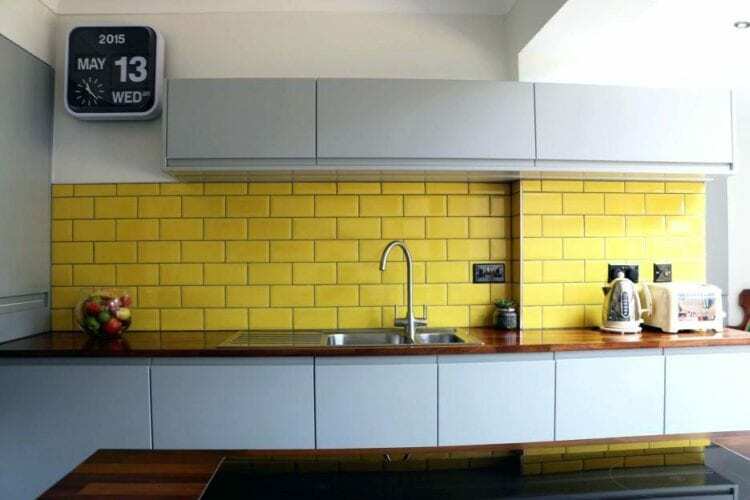 In this galley kitchen, the yellow painted backsplash makes a lively statement. 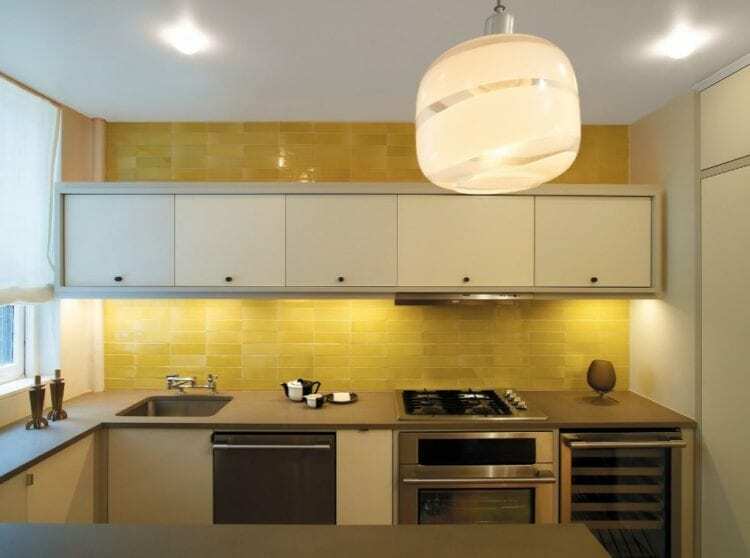 There are also yellow countertop and lower cabinets accompanying the backsplash. Wall-mounted white cabinetry and the upper half of the wall boost the modern flair. While glass windows open up space as well as connect the kitchen with surrounding nature. Have been dreaming of this kitchenette? We have, too. It is filled with all the golden things. The golden stained oak cabinets introduce warmth and luxury. 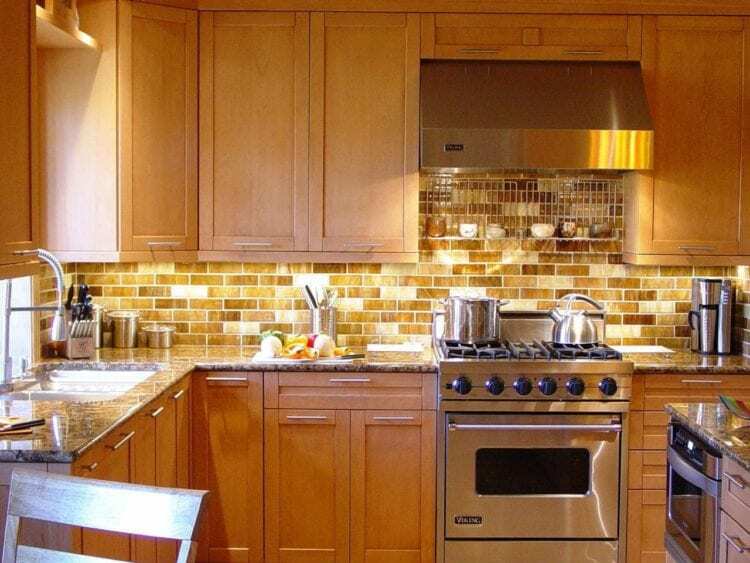 Cream and golden metro tiles on backsplash help the kitchen achieve a sumptuous look. The golden range hood and brown marble countertop heat up the entire area. This culinary space is so alluring. The trombone and eggnog yellow subway tiles with black mosaic accents dress up the backsplash. Black and cream yellow granite countertop elevate the design. A couple of vintage wooden candle holders take the center stage. 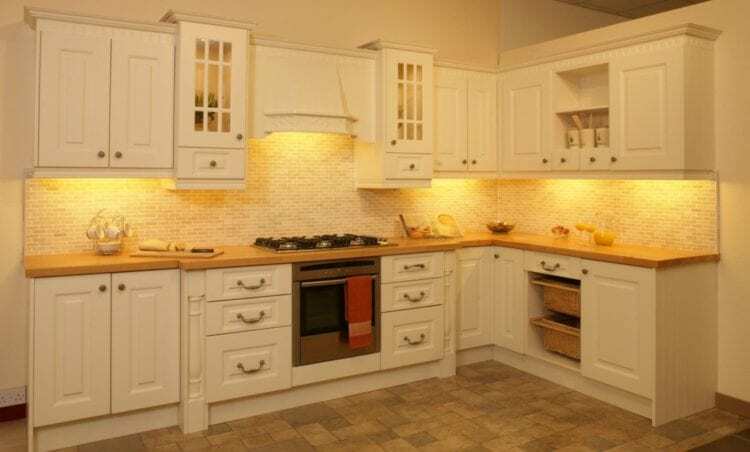 And white cabinets offer the traditional aesthetic. In essence, the kitchen is a space where you do not need to play it safe. That’s why we encourage you to go bold. 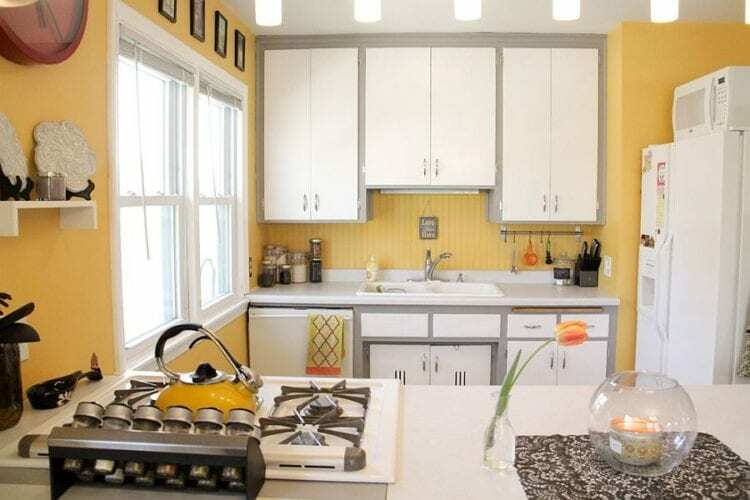 We guarantee the yellow kitchen backsplash will serve as an instant face-lift.